Marcus Rashford was pictured with Jadon Sancho while on England duty this week, and it led to one fan suggesting that the Man Utd star could be busy recruiting. It comes amid speculation that the Red Devils are ‘confident’ of signing the Borussia Dortmund starlet this summer, with the Evening Standard adding that a bid in excess of £80m could prise him away from the Bundesliga giants. The 18-year-old has dazzled in Germany this season, scoring nine goals and providing 17 assists in 35 games, which in turn has led to a call up from England boss Gareth Southgate for the upcoming Euro 2020 qualifiers. 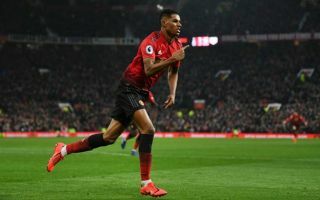 However, he could be set for a quick return to the Premier League following his exit from Manchester City last year, with their rivals now being tipped to sign him. As seen in the image below, Rashford was spotted in conversation with the youngster while on international duty, and it has unsurprisingly led to the suggestion from this particular fan that he could perhaps be using their time together to discuss a move to Old Trafford. Regardless of whether or not Ole Gunnar Solskjaer gets the job on a permanent basis, Man Utd have a group of quality young players at the club currently, and adding Sancho to that contingent could be a great move. Time will tell though if they can convince Dortmund to sell this summer, while it’s unclear if Rashford is indeed doing his part to try and persuade his compatriot to make the move to the red half of Manchester.